Pioneers in the industry, we manufacture Gas Welding Regulator such as OXYGEN/ACYTELENE/CARBON DIOXIDE/NITROGEN/ARGON Welding Regulator, Marine Regulator, Flow Regulators, Two Stage Two Dial Regulator, Single Stage Single Dial Regulator, Stainless Steel Regulator and many more items from India. 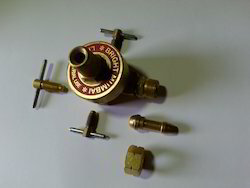 This L.P.G Regulator is used for L.P.G cylinder(Industrial) consists of forged brass body, nylon reinforced synthetic diaphragm, brass key & side lock keys, a rubber seat allows it to grip firmly on to the gas valve.Its used on the LPG gas bottle for welding, cutting & brazing operation. Also available in model no 22. 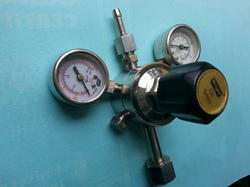 We manufacture ammonia gas regulators as per customer requirements. Looking for GAS REGULATORS ?